Every few years we totally fall in love with a new chile, and this year’s crush is the awesome piment d’Espelette, which is produced exclusively in and around the town of Espelette in the Basque region of France and Spain. The pepper came from Mexico in the 16th century and it has been widely cultivated since then; in fact, it quickly replaced the then-more-costly black pepper in many of the traditional regional dishes. You can think of it as a milder, nuanced cousin of cayenne. Here, it’s turning up on menus from coast to coast, in savory dishes from vegetables and fish to poultry and meats, and in cocktails, too. It’s prized for its nuanced flavor and subtle heat. Because of its AOC designation, piment d’Espelette is pricier than cayenne or any ground Mexican chiles. You can buy it on its own, but it’s also sold mixed with sea salt, in infused oil and as a sweet jelly—all forms are delicious. Watch out, chipotles, whole oil-packed piment d’Espelette peppers can’t be far behind. My current favorite way to use the chile it to mix it with mayonnaise and slather it on fish fillets or steaks before broiling. 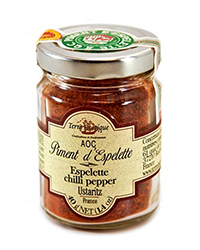 Piment d’Espelette is available at specialty food and spice shops, and from The Ingredient Finder.